Within New England, coastal grasslands and shrublands are ecologically significant ecosystems with limited occurrence. They are found on sandy or gravelly soils of glacial origin with their biota influenced by a maritime climate. They are maintained by periodic disturbances – both natural and anthropogenic. The largest occurrences are found on Long Island, Cape Cod and associated islands. Development, succession and loss of cultural processes such as grazing, plowing, and burning have led to the loss of these habitats throughout Long Island and New England. Bunch-forming grasses are generally dominant with species such as little bluestem, poverty grass, and common hairgrass. 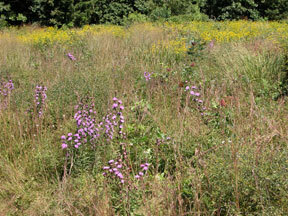 In post-agricultural fields one often finds asters, goldenrods and other perennials mixing with the grasses. Woody plants may be found here as well – blueberries, huckleberries, and red cedar, with invasive shrubs rapidly overtaking the area if no control steps are taken. Many of these coastal habitats have been lost through development of these highly desirable sites or due to lack of disturbance and subsequent succession by woody and/or invasive species. Given the limited occurrence of these areas, as they disappear, numerous species that are limited to such sites have become endangered and some, extinct. For example, these areas provide habitat for numerous federal and state listed rare plant and animal species such as sandplain gerardia, bushy rockrose, Northern harrier, and grasshopper and Savannah sparrows. In 2006, the CT Department of Environmental Protection announced a new initiative to conserve grassland habitat. Working with numerous partners, this program is aimed at preserving grasslands statewide. For more detailed information download Coastal Grasslands & Shrublands (PDF).